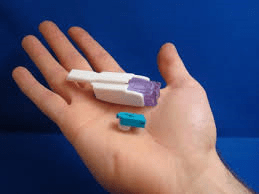 I’ve been using Afrezza for about 10 months, as an adjunct therapy to my insulin pump. Whenever my blood sugars were rising rapidly or running high, I inhale a 4 unit cartridge of powder insulin … and my blood sugars come down rapidly and level off rapidly. It works so much faster than Novolog or Humalog. It’s not for everyone and it can have some side effects … but it really works. As long as you don’t mind that some people might think you are using a mj pipe, you can even inhale in public. I HOPE MannKind is able to find another, and more successful channel for manufacturing and distribution. I HOPE it does not just simply go away, like the Asante Snap Pump or the Deltec Cozmo Pump! It was a license agreement to sell the product and they sold it for to high of a price.. Yes, and I think Sanofi did not support an adequate sales force, as they were more concentrated on Lantus and their new Toujeo. So the doctors didn’t learn enough and then didn’t prescribe. So frustrating as Afrezza works and has a place in diabetes management. Hi Tim … looks like they have an agreement with a newly formed company, Receptor Life Sciences, to address multiple inhaled therapeutic products in development for conditions such as chronic pain, neurologic diseases and inflammatory disorders. But the news release did not mention inhaled therapeutic products for diabetes, which makes me wonder if Afrezza will fall by the wayside.